With the release of his latest novel, “The Ocean at the End of the Lane,” British author Neil Gaiman dominated the literary news during the month of June. I had never read any of his book, so rather than starting with his most recent, I chose to sink into the 10th anniversary edition of his award-winning “American Gods,” first published in 2001. The novel follows Shadow, recently released from prison and on his way home to his wife and a fresh start working for a friend. But things do not go as planned, and en route, Shadow meets Mr. Wednesday, who hires the ex-con. Mystical happenings, macabre humor, and ancient legends, vendettas, and beings collide as the novel snakes its way towards a potentially grim conclusion. It’s a novel that’s hard to pin down and that requires a kind of submitting to the experience to appreciate (which I did). This is to say, it’s either an academic’s biggest nightmare or an academic’s Disneyland. If you don’t mind not knowing what’s going on at all times, the rhythmic prose will carry you along to the end, where the novel’s internal logic reveals itself. As a bonus, the 10th anniversary edition features material that was not included in the original. The pictured quote is uttered about halfway through the novel as a parenthetical aside delivered by Hinzelman, who is giving Shadow a tour of the town where he is staying (in hiding, under an assumed name). Gaiman traveled across the U.S. while writing the book, which makes it tempting to read a whole lotta something into these words (says the recovering academic). My town has a bookstore, and that’s just how I like it. But the quote—those are fighting words! 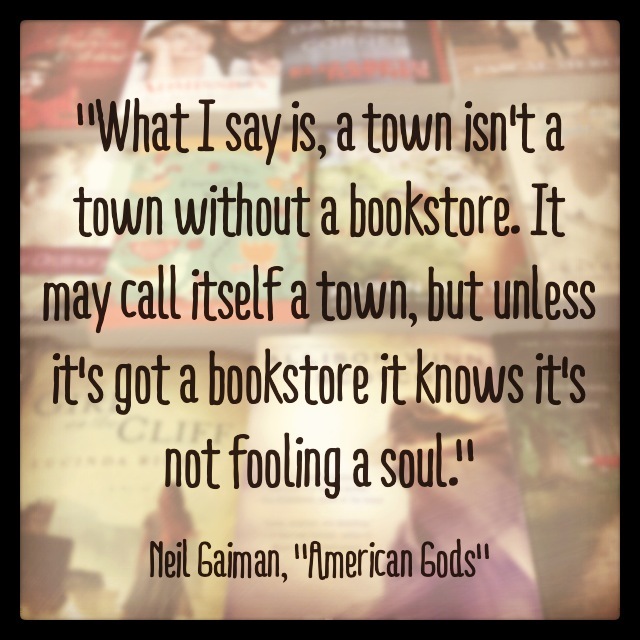 So I wonder what you think: is a town without a bookstore somehow missing a piece of its soul?